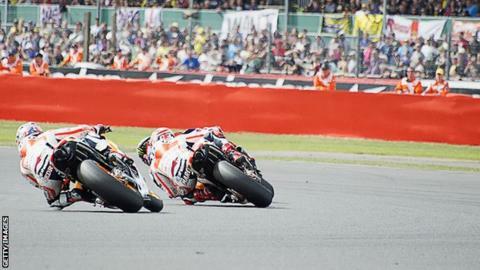 Silverstone bosses have not given up hope of retaining the British MotoGP. The circuit's five-year deal to host the race ends next week, with the yet-to-be-built Circuit of Wales set to take over from 2015. "You never know what's going to happen in the long term. We've been in this position many times before," Silverstone managing director Richard Phillips told BBC Look East. "There is a lot more to play out - let's just say that." Silverstone has staged Formula 1's British Grand Prix for the past 27 years, but almost lost the rights to Donington in 2010, before the move fell through. The Circuit of Wales is to be built in Blaenau Gwent at a cost of £315m, but it will not be ready for 2015, the first year of its five-year contract with MotoGP. "Next year is still in doubt as to whether it will come here or go to Donington," said Phillips. "We're trying to keep it here while we wait to see what happens in the long term." Construction of the Circuit of Wales has been delayed by issues over common land and calls for the Welsh and UK governments to commit up to £50m towards the scheme. "It's a competitive market and having new circuits is probably quite healthy," Phillips continued. "What I don't like is if there is public finance support for it. If there is government funding, it is an unfair playing field. "Circuit of Wales doesn't exist at the moment and they need to raise the money to be able to build it. "Probably the next six to 12 months are going to be quite telling. If the race cannot be run in Wales in 2016 then it could all be up for grabs again."